John Chisholm and the Rose City Ford team challenge local businesses, our friends and families to support the Windsor Police Toy & Food Drive! 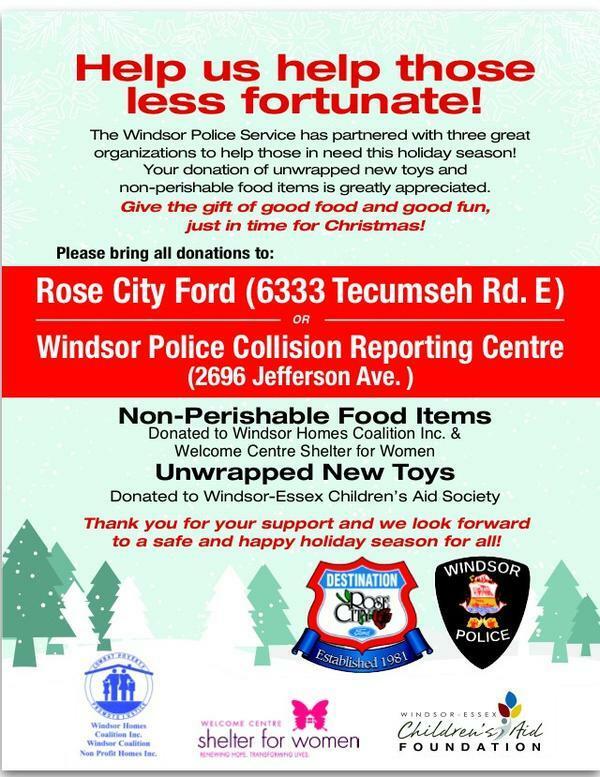 Non perishable food items & new unwrapped toys can be dropped off here at Rose City Ford or at the Windsor Police Collision Reporting Centre. Let’s make this the BEST Windsor Police Toy & Food Drive yet! — at Rose City Ford. snapd Windsor: John and Sophia Chisholm made a generous donation at Rose City Ford today towards the Windsor Police Service annual food and toy drive. Chief Frederick, Deputy Power and Deputy Derus with Guests from Children’s Aid, Windsor Home Coalition Inc and Welcome Centre Shelter For Women were in attendance. Non perishable food items and new unwrapped toys are being accepted at the Collision Reporting Centre and at Rose City Ford. - Photo by Mike Kovaliv Photography — at Rose City Ford.